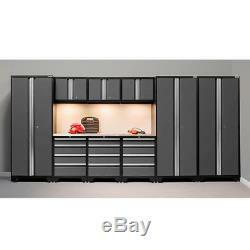 Warehouse Wall Cabinets Set Garage Workshop Cupboard Lockers Drawer Tool Storage. A great addition to your garage or workshop, the 10 Piece Cabinet Set is made from 24 gauge steel fully welded frames and 24 gauge reinforced doors. The redesigned full length easy grab handles on the fully lockable doors offer a great modern look for any garage, and the paint finish will ensure the cabinets maintain their beautiful look for a lifetime. The floor cabinets come with 5cm adjustable legs to keep cabinets level, or you may choose to mount the cabinets on the wall. Fully welded 24 gauge steel frame. Full length anodized aluminium handles. 30" lockers comes with 3 full-width shelves, adjustable in 8" (20cm) increments. All drawers are mounted on double ball bearing drawer slides. Total Dimensions: H 191 x W 412 x D 45.7kg. Full length locking mechanism locks door at top and bottom. Full length easy grab handles. Easy access cut-out for cables at the bottom of the cabinet. Dimensions: H 183 x W 76 x D 46cm. Includes attachable valance that can be used for mounting under cabinet light. Dimensions: H 46 x W 61 x D 31cm. 4 Full extension drawers with double ball bearing slides. Key mechanism simultaneously locks all drawers. Dimensions: H 76 x W 61 x D 41cm. 1 x 72 (183cm) Stainless Steel/Bamboo Worktop. Solid 1 (2.5cm) thick worktops to be mounted on top of base cabinets. Heavy duty finish that wipes clean. Solid worktop core allows for easy installation. Dimensions: H 2.5 x W 183 x D 46cm. 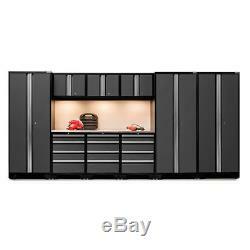 The item "Warehouse Wall Cabinets Set Garage Workshop Cupboard Lockers Drawer Tool Storage" is in sale since Wednesday, November 7, 2018. This item is in the category "Home, Furniture & DIY\Furniture\Cabinets & Cupboards". The seller is "*value4moneydeals*" and is located in London. This item can be shipped to United Kingdom, Austria, Belgium, Bulgaria, Croatia, Cyprus, Czech republic, Denmark, Estonia, Finland, France, Germany, Greece, Hungary, Ireland, Italy, Latvia, Lithuania, Luxembourg, Malta, Netherlands, Poland, Portugal, Romania, Slovakia, Slovenia, Spain, Sweden, Australia, United States, Brazil, Japan, New Zealand, China, Israel, Hong Kong, Norway, Indonesia, Singapore, South Korea, Switzerland, Taiwan, Thailand.